As Halloween approaches next month, stores are filling with costumes and candy, but marketers are more concerned about the success that their email marketing campaigns will scare up. To offer a glimpse at what these marketers can expect from this year’s haunting holiday, MediaPost.com featured findings from a recent report of the top trends gleaned from 2011’s email campaigns. Last year, more than half of the Halloween-focused email volume was sent from multi-channel retailers and catalogers. More than one-third of total mailings were sent during the entire month of September. 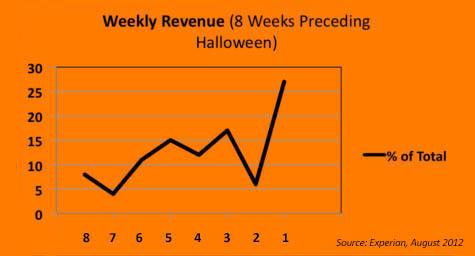 Interestingly, approximately that same percentage of volume was sent during the last week of October alone, with those final days resulting in more than one-quarter of all holiday revenue. Based on the report, it appears that the period between mid-September and mid-October is the ideal time to start raising the volume of digital Halloween mailings. In regard to the subject lines for these emails, general terms like “Happy Halloween,” “candy” and “costumes” were popular. Special promotions were also well received, especially when the offer opportunity was incorporated into the email subject lines. These mailings generated higher revenue and transaction rates per email. In addition, emails that highlighted “dollars off” in the subject line provided Halloween marketers with the sweet reward of over 60 percent higher transaction rates than the holiday average. Creating a sense of urgency in email subject lines was also extremely effective at driving higher revenue and transaction rates. Yet remember, there is no need to reserve this urgency for the days just prior to the holiday. In fact, the report showed that emails sent in early October that included phrases alluding to time running out and last chance for free shipping received higher-than-average transaction rates overall. To implement the top email marketing trends and realize higher revenue and transaction rates per email, contact MDG Advertising today at 561-338-7797 or visit mdgadvertising.com.